Mildred "Millie" Lutton Rohr, age 94, of Canal Fulton, and formerly of Alliance, passed away at 9:08 a.m. Sunday, July 29, 2018 at Woodlawn Compassionate Care in Canton. She was born May 18, 1924 in Sebring, Ohio to Homer and Cleda (McCausland) Zurbrugg. Millie was a registered nurse, having worked as a pediatric nurse at Alliance City Hospital, as a visiting nurse in Alliance, and as a Stark County public health nurse. She retired in 1984. 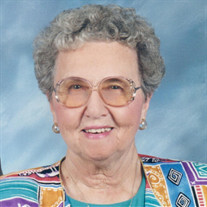 She was a member of the Canal Fulton United Methodist Church and a former member of the Beechwood United Methodist Church. She belonged to the Canal Fulton Senior Center where she started a kitchen band, playing keyboard. Survivors include her husband, Delbert Rohr, whom she married March 27,1976; children Denny (Jody) Lutton of Canton and Margie Dambrowski of Dayton;, step-children Mary Ellen (John) Destefano of Alliance, Lori Rohr of Columbus, and Steve (JoLin) Rohr of Richmond, VA; siblings Vera Spear and Ralph Zurbrugg; grandchildren Heather, Jay, Adam, Nick, Kelsey, Kyle, and Karli; step-grandchildren Christina, Bob, Dusty, Jessica, Jason, McKenzie, Tiffany, and Tara; 25 great-grandchildren; numerous beloved nieces and nephews. She was preceded in death by her parents, her son, Walter Clare Lutton; former husband Walter C. Lutton, Jr.; sisters Helen Kandel and Dorothy Wafler, and brother Kenny Zurbrugg. Services will be held at 11:00 a.m. Thursday, August 2, 2018 at the Canal Fulton United Methodist Church, 363 Cherry St. W., Canal Fulton, Ohio 44614 with Pastor Don Ackerman officiating. Friends may call from 6-8 p.m. Wednesday, Aug. 1, at Cassaday-Turkle-Christian Funeral Home and one hour prior to the service at the church. Interment will be at Highland Memorial Park, Beloit, Ohio. Memorial contributions may be made to the Canal Fulton United Methodist Church or Aultman's Compassionate Care Center, 2821 Woodlawn Ave. NW, Canton, Ohio 44708. Arrangements are with Cassaday-Turkle-Christian Funeral Home, 75 S. Union Ave. Alliance, Ohio 44601.